Auction Date: Fri 05 Apr 2019, 3:00 PM | GVM Auctioneers, 25 / 26 Glentworth Street, Limerick. A Prime residential roadside holding extending to circa 42 st acres. Auction on Friday 5th April at 3pm in our Limerick City Auction Rooms (UPS), 25/26 Glentworth Street, Limerick. This property is situated just 1 kilometre south of the hugely popular tourism and picturesque village of Adare. The lands are truly in superb quality, laid out in easily managed divisions and well watered and fenced. There is a piped and natural water supply. Very extensive road frontage to the main Limerick/Killarney Road. The two storey residence is in need of repair but offers huge potential. A large range of out offices are also located on the lands including a hay barn , loose shed and yard. Inspection of this magnificent property is very highly recommended. Solicitors :- Valerie Noonan, MF Noonan and Co., Solicitors, Main Street, Rathkeale, Co. Limerick. Full details Contact Tom Crosse on 087-2547717 or John O Connell on 087-6470746. Travelling from Limerick City proceed out to Adare Village and continue straight through on the N21 for approximately 1 kilometre. This property is located on the left hand side. GVM sign thereon. 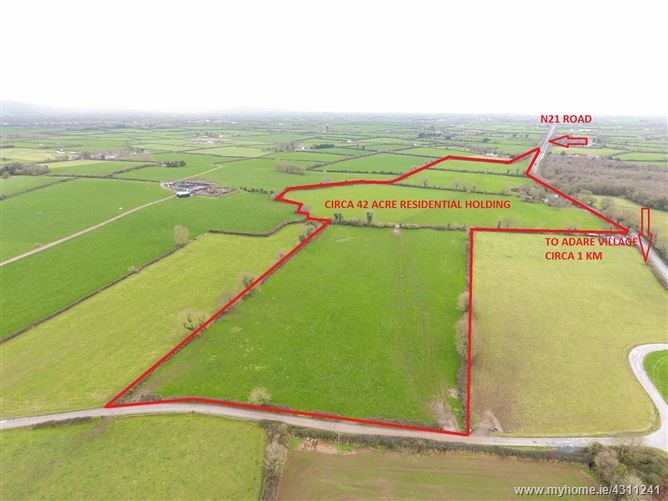 This property is situated in very close proximity to the heritage village of Adare recognized as one of the prettiest villages in the country boasting a very high volume of tourist traffic and located just 15 km west of Limerick City.